A well-made wooden fence helps to ward off the invaders like dogs, cats and rabbits, and also guards your privacy. However, before building and installing a fence, you would have to do certain things viz. Firstly, you would have to take permission from the Building Department and Homeowners Association. You would also have to talk to your neighbors and tell them about your intention of installing a fence around your garden. Thirdly, you would have to get in touch with the electricity, telephone and sewage companies to ascertain the position of the cables and pipes. Fourthly, you would have to level out your uneven garden and lastly, you would have to decide whether to erect the fence on all four sides of the garden or only on the three sides. After you have accomplished all the above tasks, measure the perimeter of your garden. This will help you to determine the number of panels you would need to build a complete wooden fence. Ideally, 6-feet panels are used for the fence, and to find out the number of panels you would need, divide the perimeter by 6. It is advisable to buy a few extra panels to be able to deal with messy situations. As the fence would be exposed to the elements of nature, therefore pretreated lumber is the best for it. 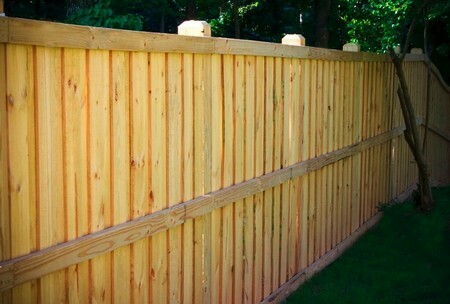 Normal lumber can also be used, but you would have to paint it before or immediately after installing the fence. Here is a list of tools and materials that you would need to build the wooden fence. The first thing that you have to do is to install the fence post. With the help of post-hole digger, dig a hole in one corner of your garden. Place the fence post and pour concrete. To ensure that the post remains upright, brace it up with a piece of lumber. Likewise, affix the second post exactly 8-feet away from the center of the first one. Install the remaining fence posts in the similar manner. In the next step the panels have to be installed. With the aid of deck screws attach the panels to the posts on either side. Use at least 2 screws to fix the panels to the fence posts. For the installation of the gate, posts should be present on either side. On these posts, mark the position where the hinges would be placed. Use the electric driller to drill holes and install the gate with the help of deck screws. Finally, attach the latch to the gate.